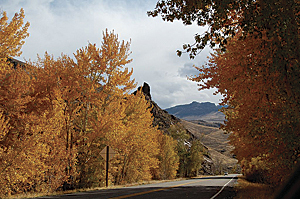 Once considered part of the American Wild West, today the state of Idaho is a large, sparsely inhabited state. It is a land of contrast, with spectacular mountains, deep gorges, and nine national forests covering two-fifths of the state. Most of the state's population lives in the semiarid southern Snake River Plain, a land of rolling hills, in marked contrast to the rugged, mountainous central and extreme eastern parts of the state. 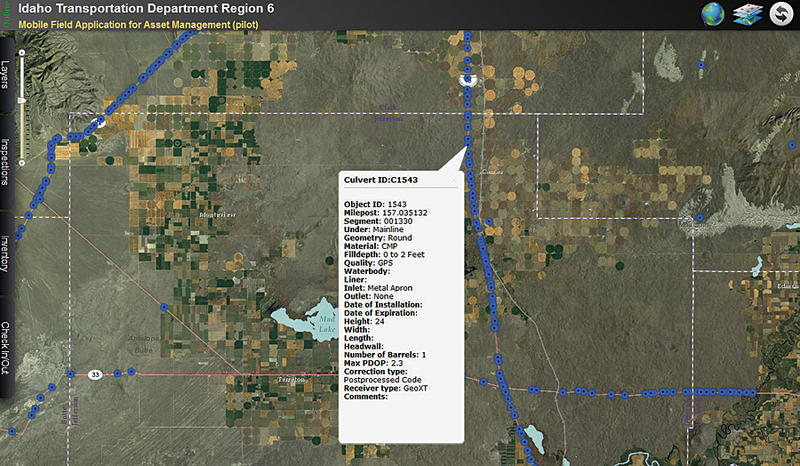 Naturally, Idaho's roads link all this diversity together. ITD District 6, under Shaw's guidance, was looking to work with a US-based company with ArcGIS Online expertise, which specialized in the development of mobile applications. He narrowed the field down to WebMapSolutions, a GIS software company and Esri Partner based in Salt Lake City, Utah, specializing in the development of both web and mobile GIS applications. 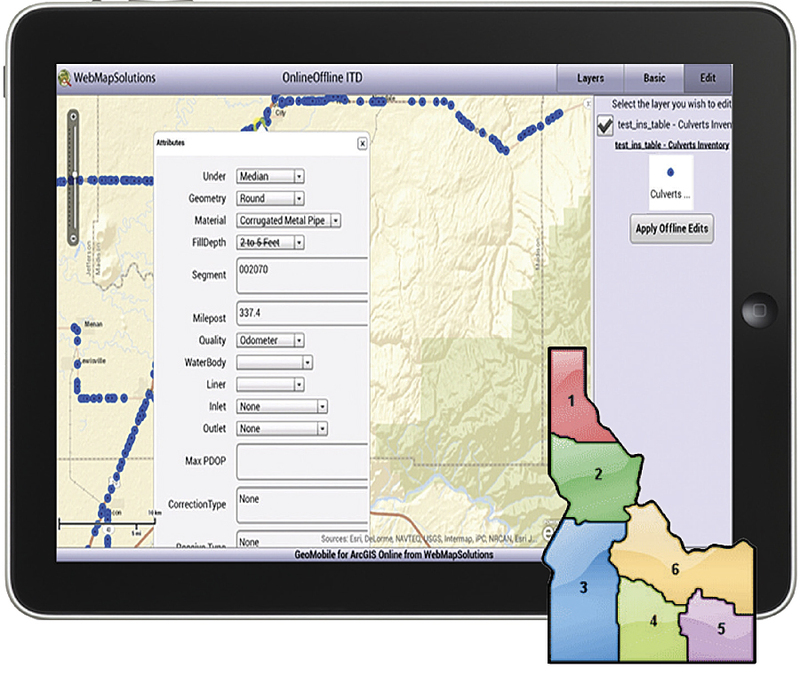 Much of the company's focus is now on ArcGIS Online. Given this in-depth knowledge of ArcGIS Online and mobile development, ITD District 6 commissioned WebMapSolutions to help with this investigation. The work was funded by the US federal government and closely supported by Esri under the American Association of State Highway & Transportation Officials Technology Implementation Group UPlan initiative. The mobile application planned was to provide data collection and editing capabilities to field crews. So inspections of ITD assets, such as culverts, would be done using a tablet-based mapping application instead of pen and paper. 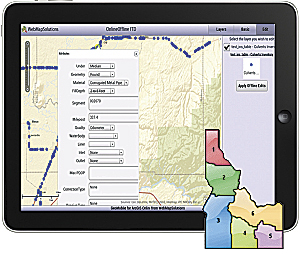 Feature attributes could be updated, new features added, and images attached to individual features and then uploaded to ArcGIS Online directly from the mobile device. Given the lack of Wi-Fi access in much of the state, a key requirement of the mobile app was for it to function in both connected and disconnected modes. Mobile technology continues to evolve. There are two "flavors" of mobile apps: those accessed via a web browser and those that are installed and can be downloaded from the Apple and Android mobile app stores. In phase 1 of the project, it was decided to develop a web-based, mobile, cross-platform application built in HTML5. Given the new requirements, most notably offline data access and editing, it was decided to develop an installed application in place of a web app. Adobe's Flex was used in place of HTML5.